The GD Subaru STI is an iconic tuner car. The platform is highly developed and can easily generate supercar like performance for a really low price. It is a well developed platform which has been raced in nearly every form from road racing to rally. A lot of development means that there are plenty of high quality parts available off the shelf for the car making it an exciting candidate for project car greatness. Of course we have been wanting to do another GD project car since the white car from our early days of MotoIQ. That car never got completed, it was in an accident and sat for a year while the owner decided what to do with it. Finally he fixed it minimally and dumped it for cheap. It was time for another car. Our first car was an early 2004 STI. This was the STI’s first year and it had problems. It had wimpy hubs with small bearings which quickly developed play causing brake piston knockback with an intermittent case of the brake pedal going to the floor. The hubs had an odd 5×100 bolt pattern which limited wheel choices. It had a weak steering rack that developed play with soft, slipping mounts. This made for an inconsistent steering wheel center and a mushy steering feel. Finally the engine management had some quirks, it liked to detonate even at stock boost levels. For that reason we selected a 2005 STI as the basis of our project. Subaru had addressed most of the bugs in the first US market STI with stronger hubs and steering. Now it was our turn to enhance the platform. Our idea is to try and build the ultimate street going STI that is still practical for daily driving. This means top notch handling and braking with out excessive harshness and poor short term wear. No laggy or high strung engines with poor driveability and fuel economy would be acceptable either. Still the car must be capable of going straight from the street to the track, be driven hard without going uncle and be driven home without having to mess with tire and brake pad changes. To start our project we shopped for several months before finding our project car. Unfortunately STI’s are popular car to be modified and many examples are butchered with poor quality workmanship and parts. Many more have been driven hard and put away wet by indifferent owners. Our project car was a stock 2005 STI owned by a mature person who took meticulous care of it and kept excellent service records. The car had changes of synthetic oil every 3000 miles for its nearly 50,000 miles of use and had never been driven in the rain! The undercarriage and engine bay were like new. The paint and interior were mint. STI’s like this are very much sought after and go for a premium. We paid more than we wanted to but after looking at beat and butchered STI’s for months, we just paid the 20k the owner insisted on and went on our way. For our first installment of project STI we will set about building our suspension with some quality parts, fixing some of the STI’s inherent weak points and taking care of 50,000 miles of wear and tear at the same time. 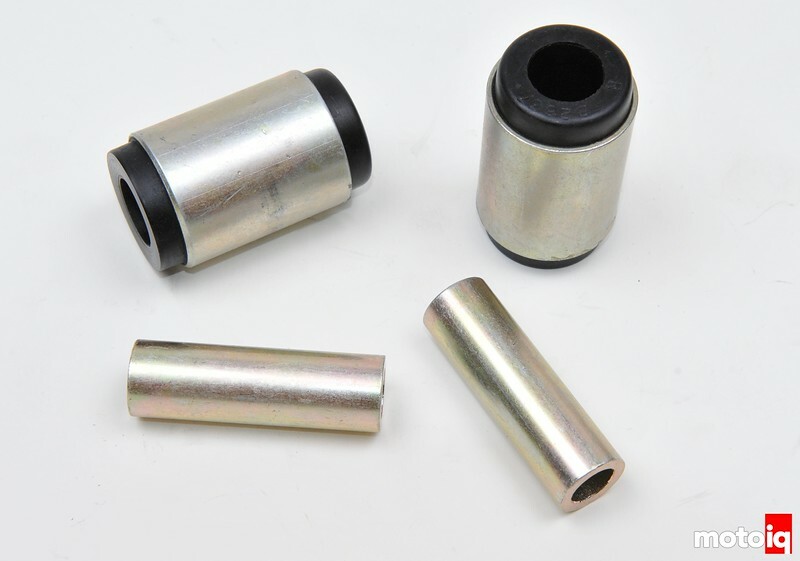 Our car had some very worn bushings in the suspension as the car made horrible banging and clunking noises when being driven over bumps and when starting, stopping and shifting so we decided to address these issues first with some quality parts from Whiteline. Whitelines bushings were developed for the extreme conditions of Australia’s back roads and have some good engineering features like OEM quality steel retainer sleeves and engineered flex points to avoid binding when needed. 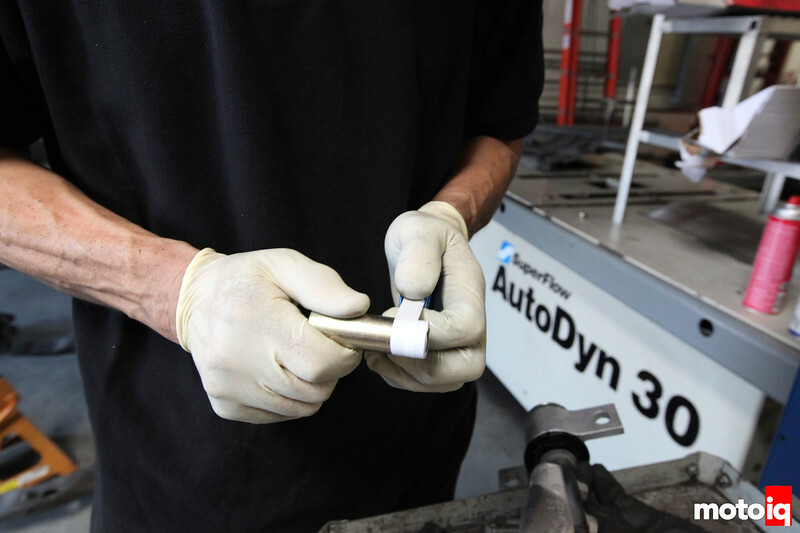 Whiteline bushings for this application come in three different hardness levels: Ride Comfort, Performance and Motorsports. We opted for the hardest Motorsports grade as we felt that even hard urethane is more driver friendly than bearings. We will report to you on our opinion of just how streetable the motorsports grade bushings are. We wanted to switch out the old rubber bushings with some high quality parts produced by Whiteline. Whiteline makes three grades of bushings for the STI, Soft but firmer than stock Ride Comfort, firmer Performance and hard Motorsports. We opted for the hardest Motorsports bushings because they are still bushings after all, not something really hard like bearings! The Whiteline bushings are really high quality. Most of the bushings have an OEM quality steel shell to minimize the urethane thickness and to support the bushings like the OEM part. This is unusual for an aftermarket urethane bushing. 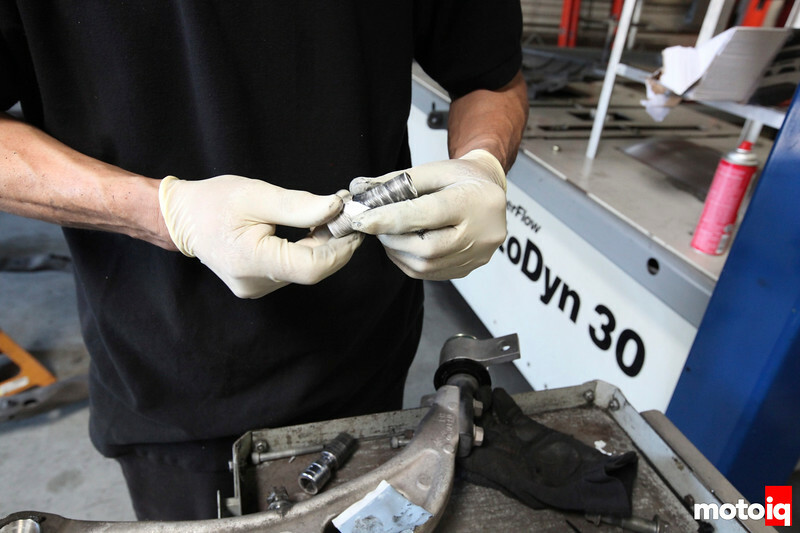 The front lower control arm bushing is shown here. 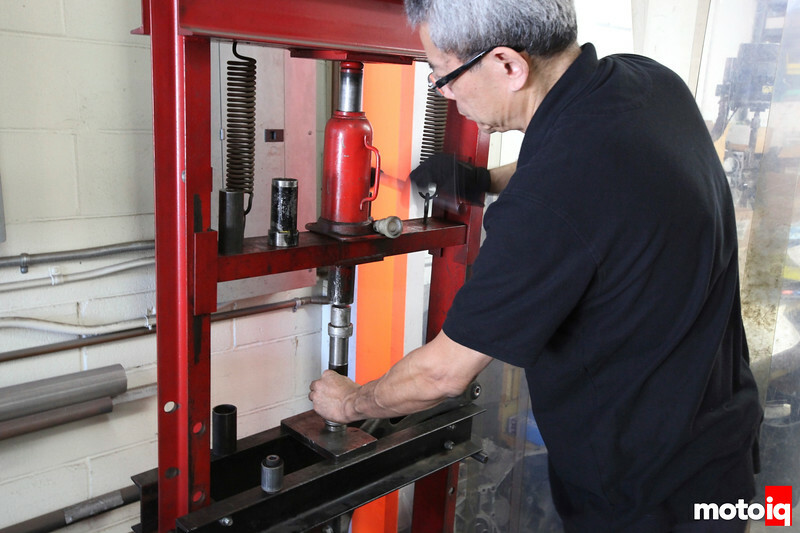 Howard Watanabe of Technosquare presses out the old rubber bushing and presses in the Whiteline parts. You should never burn out the old bushings like many people do with a forged aluminum arm like like the STI has. Aluminum can lose its strength properties at the temperatures that burning out can reach and you don’t want to weaken your suspension parts! One of our tricks to reduce static friction with urethane bushings and to make them long term squeak resistant is to wrap the inner sleeve of the bushing with a layer of teflon tape. The slippery teflon minimizes friction which improves ride comfort and mechanical grip. It also prevents squeaking. Whiteline bushings use a formulation of urethane that does not squeak as much as others but we still wanted to lower the friction. 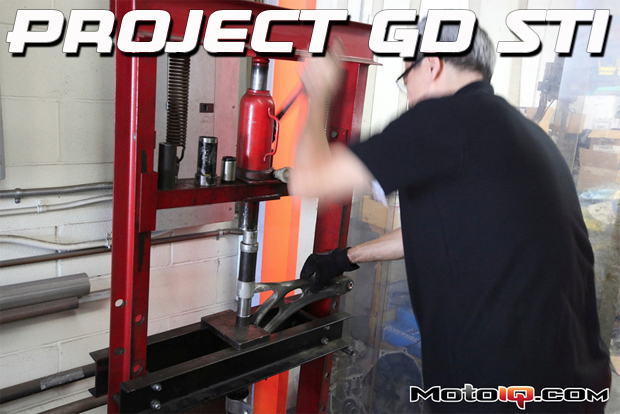 We apply the moly grease supplied with the bushings over the tape. 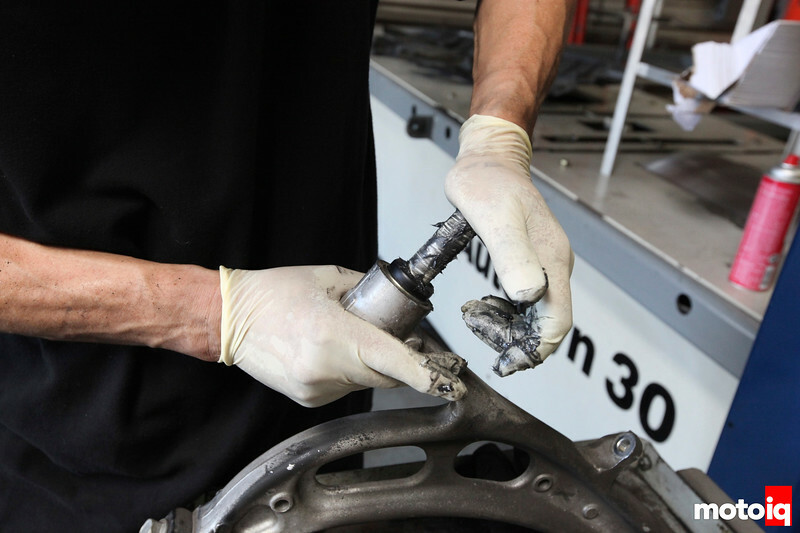 After greasing the inside of the bushing, we carefully push our taped and greased sleeve into the bushing. This ensures a smooth ride and squeak free use even with the hard Motorsports bushing.